Bring your message right to the mail box! What most do not realize is that this type of mailing has been around for years, known as a carrier route mailing. The only difference with Every-Door Direct Mail is that the pieces have to be a very specific size, and the post office has branded this new product and spent a great deal of money advertising it. 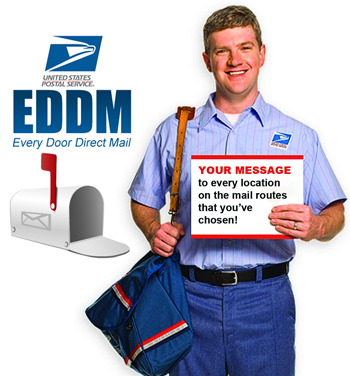 What is EDDM (Every Door Direct Mail)? EDDM is a way for businesses to mail to every home in a specific area or zip code at a discounted postage rate. The mail piece has to be a very specific size (you can request samples that follow the EDDM template here) and has to follow exact EDDM USPS guidelines to format the mail piece, pull the mailing list, prep the mailing and deliver it to the post office. The USPS has laid out all of these instructions in a way that small business owners can understand, in an effort to make sending out direct mail easier for them. Even though you can do it yourself, it is still time consuming and there are EDDM printers and mail houses who can do all of the leg work for you, often times saving you additional money over doing it yourself. EDDM (Every Door Direct Mail) is a new promotion being rolled out by the US Postal Service that enables regular retail businesses to mail at an astounding 16 cents per postcard without even needing to have a mailing address. USPS Postage for EDDM service is only 16 Cents per post card and you have a big range of sizes to chose from (minimum size for EDDM post cards is 9×6-1/4). While normal Post Card is limited in size (Maximum 6″ x 4-1/4″) and the postage is 33 cents. Save on postage by using the EDDM service of USPS instead of using mailing lists. we have an expert team to answer all your questions. Arrange your appointment and we’ll send an associate to discuss the details with you. We are the leaders in Window Graphic Signage called “Perforated Vinyl” or “One-Way-Vision” material. We provide complementary Graphic Design for all our clients!